Aim and Objective: The present study was aimed at assessing the rapid microwave-assisted tissue processing and staining to determine if it can replace standard formalin-fixed and paraffin-embedded processing and staining technique. Materials and Methods: The study group consisted of 15 oral mucosal biopsies. The specimens were fixed in 10% formalin for 24 hours to ensure adequate fixation and their gross features were recorded, photographed, and then the specimens were cut into equal halves to be processed by both conventional and microwave histoprocessing methods and then subsequently stained with H and E by microwave and conventional methods. The stained slides in each group processed by both microwave and routine methods were randomly numbered for a blind study and circulated among six observers. All the observers were asked to grade each parameter into Excellent/Good/Average/Poor in a data sheet comprising a total of six parameters. These gradings were given a numerical value of 4, 3, 2 and 1, respectively. The parameters included in the data sheet were cellular clarity, cytoplasmic details, nuclear details, color intensity, interface of epithelium and connective tissue. Wilcoxon-matched pairs signed rank test (non-parametric) was used to calculate the test of significance (P value). Results: The total processing time involved in microwave was 42 minutes and 270 minutes for the conventional method. H and E staining in microwave took 33 minutes and 40 minutes for conventional method. Conclusions: The individual scores by different observers regarding the various parameters included in the study were statistically insignificant, the overall quality of microwave-processed and microwave-stained slides appeared slightly better than conventionally processed and stained slides. The study group consisted of 15 oral mucosal biopsies received in the Department of Oral Pathology, Sri Ramachandra Dental College, Chennai, and the specimens were fixed in 10% formalin for 24 hours to ensure adequate fixation. Their gross features, namely, weight, color, consistency, and dimensions were recorded. The specimens were then subsequently photographed and cut into equal halves to be processed by both conventional and microwave histoprocessing methods and subsequently stained with H and E by microwave and conventional methods. The stained slides in each group processed by both microwave and routine methods were randomly numbered for a blind study and circulated among six observers. All the observers were asked to grade each parameter into Excellent/Good/Average/Poor in a data sheet comprising a total of six parameters. These gradings were given a numerical value of 4, 3, 2 and 1, respectively and the observers were referred to as O1, O2, O3, O4, O5 and O6, respectively. The parameters included in the data sheet were cellular clarity, cytoplasmic details, nuclear details, color intensity, interface of epithelium and connective tissue. Wilcoxon-matched pairs signed rank test (nonparametric) was used to calculate the test of significance (P value). Samsung Microwave Oven (model 183ST) with a maximum output of 850 W was used. Two microwave-resistant glass beakers of 200 ml each, 100% methyl alcohol as dehydrating agent (Qualigens, Product no. 32407), 100% isopropyl alcohol as intermedium (Qualigens, Mumbai, India Product no. 26897), paraffin wax (Qualigens, Product no. 19215), thermometer to measure temperature, plastic tissue cassettes and hand towel to handle the utensils used in microwave oven were used. Only one tissue was processed at a time. The adequately fixed sample was water washed for 5 minutes to remove excess formalin from the tissue. The tissue was transferred to a beaker containing 200 ml of 100% methanol for dehydration and the microwave was set at 300 W for two 7-minute cycles. The tissue was transferred to a beaker containing 100% isopropyl alcohol with the same microwave settings. The specimen was then transferred to a beaker containing 200 ml of molten paraffin wax for wax impregnation and the tissue was embedded in molten paraffin wax immediately. The tissue block thus obtained was sectioned, dewaxed and then stained with H and E using microwave oven. The time gap between the irradiation cycles was almost immediate and as soon as the first cycle was completed, the second cycle was started. The ribbon sections obtained were dewaxed in xylene, with two changes of 10 minutes each, and hydrated in running tap water for 5 minutes. Fifty milliliters of hematoxylin stain was taken in a small Petri dish More Details and the slides containing tissue sections were placed in the Petri dish and the microwave oven was set at 300 W for 30 seconds. The slides were immediately transferred to running tap water for blueing. The sections were differentiated in acid alcohol (one to two dips) and then they were water washed in running tap water for 5 minutes. Fifty milliliters of eosin stain was taken into a small Petri dish and the sections were transferred to it. Microwave was set at 300 W for 30 seconds. The sections were water washed in running tap water for 2-3 minutes to remove excess stain. They were dehydrated in absolute alcohol (two changes). The slides were air dried and mounted. The stained slides in each group, processed by both microwave and routine methods, were randomly numbered for a blind study and circulated among six observers. Each observer was asked to grade each parameter into Excellent/Good/Average/Poor in a data sheet comprising a total of six parameters. These gradings were given a numerical value of 4, 3, 2 and 1, respectively, and the observers were referred to as O1, O2, O3, O4, O5 and O6, respectively. The parameters included in a data sheet were cellular clarity, cytoplasmic details, nuclear details, color intensity, interface of epithelium and connective tissue. Wilcoxon-matched pairs signed ranks test (nonparametric) was used to calculate the test of significance (P value). The slides were produced in 75 minutes as compared to 310 minutes in routine processing [Table 1], [Table 2] and [Table 3]. The parameters in our study namely cellular clarity, cytoplasmic details, nuclear details and color intensity, interface of epithelium and connective tissue, fibrous tissue appeared slightly better in microwave method than routine method [Table 4], [Table 5], [Table 6], [Table 7], [Table 8] and [Table 9], [Figure 1], [Figure 2] and [Figure 3]. We experienced a 51% of shrinkage in microwave method as compared to 47% in routine method after alcohol steps. Tissues appeared much firmer in microwave method than in routine method as it is attributed to heat generated by microwave oven. 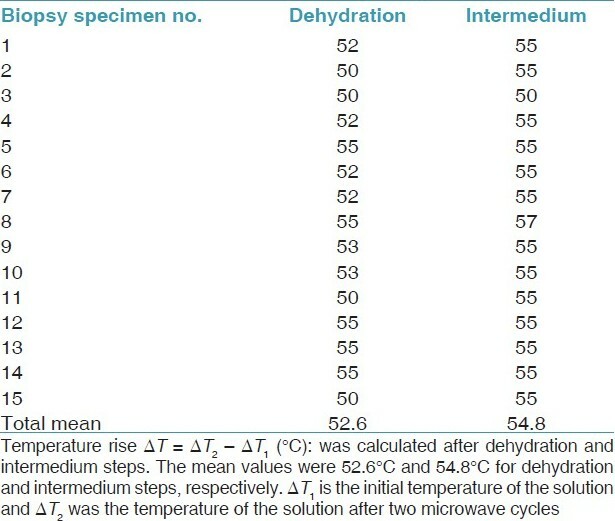 The average temperature rise (ΔT) recorded by thermometer after dehydration step was 53.25°C (maximum 87°C and range 50-57°C) and after intermedium step was 54.75°C (maximum 87°C and range 50-57°C) [Table 10]. We used a domestic microwave oven (Samsung 183 ST) with a maximum output of 850 W. Histoprocessing was carried out with a power output of 300 W and a relatively short cycle time of 7 minutes each and this setting was adopted by us, as this had not shown any detrimental effects on final microscopic view of the specimen. Metals and metallic utensils are contraindicated for use in microwave ovens due to total internal reflection of microwaves, leading to sparkling. , Hence plastic cassettes in place of metal cassettes during tissue processing were used. These cassettes are relatively cheap and can be reused. Tissues appeared much firmer after alcohol steps and pale in color in microwave method as compared to routine method. Microwaves can penetrate to a maximum depth of 2 cm and hence they may require a few additional cycles of dehydration in larger tissues. This problem has been in overcome in this study, as all specimens selected were less than 2 cm in thickness. Two sets of slides comprising 15 in each group, processed by both microwave and routine methods, among six observers were circulated. Their compiled data were taken into account. Cellular clarity, cytoplasmic details, nuclear details and color intensity were slightly better in microwave method than in routine method [Table 4], [Table 5], [Table 6] and [Table 7], [Figure 1] and [Figure 3]. This is consistent with the studies of Kok and Boon. ,, This is attributed to uniform distribution of heat and effective dehydration. All the observers were in agreement with this finding. Interface of epithelium and connective tissue has been a special area of interest for a pathologist in ruling out invasion and in many other immune-mediated disorders. , It appeared better in microwave method than in routine method and is supported by five out of the six observers. There were not enough studies highlighting this aspect using a microwave method of tissue processing [Table 8], [Figure 1]. Fibrous tissues have a special interest in pathological diagnoses and often are the cause of difficulty in sectioning on a microtome. They often require additional or extended dehydration times which was not a problem in our study with our microwave setting. These tissues appeared better in microwave method than in routinely prepared slides. Majority of the observers were in agreement with this finding [Table 9], [Figure 2]. The overall quality of microwave-processed and microwave-stained slides appeared slightly better than routinely processed and routinely stained slides. The microscopic results were excellent even for adipose tissue and fibrous tissue, which have been a considerable problem to a histotechnologist, often requiring additional dehydration times and additional time on ice before sectioning on a microtome. Staining time was considerably reduced from 40 minutes in routine method to 33 minutes in microwave method for regular H and E slides. In our study it was found that microwave processing considerably shortens the time for permanent histological sections without a demonstrable decrease in section quality or interpretation. 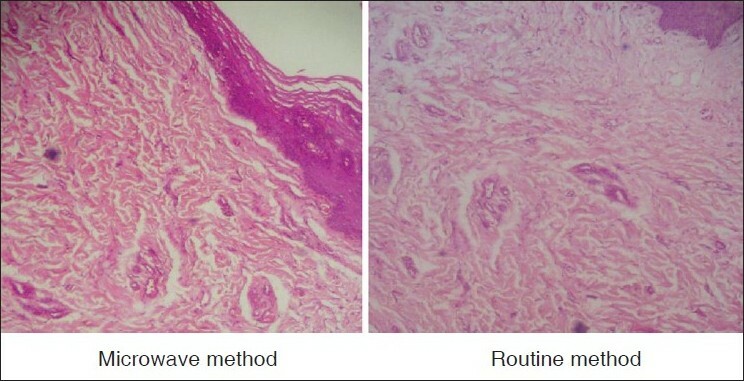 The overall quality of microscopic tissues of routine and microwave processing methods was similar and it was not possible to distinguish between the two techniques. Hence, from our study, we would like to conclude that microwave technique of tissue processing can be adopted in the regular histopathology laboratory on a regular basis, and considering the considerable shortening of time period, microwave technique can replace the well-established routine tissue processing. We strongly believe in a famous quote "A stitch in time saves nine" and hence we have made an attempt toward faster, reliable, cost-effective diagnosis and timely institution of treatment for better health care. 1. Rohr LR, Layfield LJ, Wallin D, Hardy D. A comparison of routine and rapid tissue processing in a surgical pathology laboratory. Am J Clin Pathol 2001;115:703-8. 2. Kok LP, Boon ME, Suurmeijer AJ. Major improvement in microscopic-image quality of cryostat sections. Am J Clin Pathol 1987;88:620-3. 3. Culling′s CF, Allison RT, Barr WT. Cullings Histological Technique Processing. 4th ed. London : Butterworths and Co-publishers; 1985. p. 51-77. 4. Bancroft JD, Gamble M. Theory and Practice of Histological Techniques. 5 th ed. Missouri: Harcourt Publishers; 2002. 5. Morales AR, Nassiri M, Kanhoush R, Vincek V, Nadji M. Experience with an automated microwave assisted rapid tissue processing method. Am J Clin Pathol 2004;121:528-36. 6. Leong AS. Microwaves and turnaround times in histoprocessing: Is this a new era in histotechnology? Am J Clin Pathol 2004;121:460-2. 7. Kok LP, Boon ME. Microwave Cookbook for Microscopists. Art and Science of Visualization. 3 rd revised ed. Leiden: Coulomb Press Leyden; 1992. p. 9. 8. Microwave processing technique for microscopy. Available from : http://www.ebsciences.com/papers/microwaves.htm [last accessed on 2009 Nov 24]. 9. Kayser K, Stute H, Lubcke J, Wazinski U. Rapid microwave fixation: A comparative morphometric study. Histochem J 1988;20:222-5. 10. Bancroft JD, Gamble M. Theory and Practice of Histological Techniques, Chapter no. 6. 5 th ed. London: Harcourt Publishers; 2002. p. 85-108. 11. Bostwick DG, Al Annouf N, Choi C. Establishment of the formalin free surgical pathology laboratory. Arch Pathol Lab Med 1994;118:298-302. 12. Slap S. Application of microwave technology to histology. In: Bancroft JD, Gamble M, editors. Theory and Practice of Histological Techniques. 5 th ed. London: Harcourt Publishers; 2002. p. 416. 13. Boon ME, Kok LP, Ouwerkerk-Noordam E. Microwave-stimulated diffusion for fast processing of tissue: Reduced dehydrating, clearing and impregnating times. Histopathology 1986;10:303-9. 14. Kok LP, Visser PE, Boon ME. Histoprocessing with the microwave oven: An update. Histochem J 1988;20:323-8. 15. Neville BW, Damm DD, Allen CM, Bouquot JE. Oral and Maxillofacial Pathology. 2 nd ed. Missouri: Elsevier Publications; 2002. 16. Regezi JA, Scuibba JJ, Jordan RC. Ulcerative Conditions. Oral Pathology. Clinical Pathological Correlations. 3rd ed. Philadelphia: W. D. Saunders Company; 1999. p. 69-80.
tripathi, m. and bansal, r. and gupta, m. and bharat, v.
Bhuvanamha Devi, B. and Subhashree, A.R. and Parameaswari, P.J. and Parijatham, B.O.